The Mikvah is open! Please email or call for a visit or free tour - email bgmikvah@gmail.com or call (224) 442-4241. Renewal. Rejuvenation. Excitement. Anticipation. These are some of words women have used to describe the mikvah experience and the effect it has had upon themselves, their marriage relationship and their spiritual well-being. The mikvah is a pool of living waters, a pristine reservoir of natural rainwater that transforms and restores, a special private space and moment in time that allows a woman to focus on a total immersion of her body, mind and soul. She connects with her natural rhythms and discovers a freshness, a renewal that brings new energy and sense of completeness within herself. Discover the ancient yet timeless secret of Jewish femininity, and the divine key to marital harmony, by learning more about this precious and beloved Jewish tradition. Classes are available, individually or in small groups. 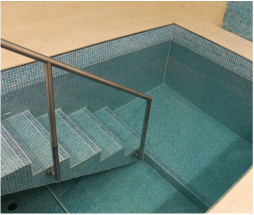 Experience this unique mitzvah by visiting the first mikvah in the northwest suburbs right here in Buffalo Grove! For more information email bgmikvah@gmail.com or call (224) 442-4241. The Mikvah is a beneficiary of MikvahUSA.